Under the new rules of golf, players may take relief for an embedded ball anywhere in the “general area” (except in sand). New Year, new Rules. Golf’s new Rules are now in effect. Under the new Rules of Golf, there will be no penalty if a ball played from the putting green hits a flagstick left in the hole. Get familiar with the some of the changes in the new Rules of Golf, before they go into effect on January 1, 2019. Get an inside look at the process of rating a golf course and how the numbers for Course Rating and Slope Rating are determined for each course. On February 1, 2018, the Washington State Golf Association launched a brand new benefit for WSGA members. Previewing the 2018 WSGA Championship schedule. Jim McNelis of Gig Harbor, Wash. wins the 31st Washington State Senior Men's Amateur Championship. John Gallacher of Burnaby, B.C. 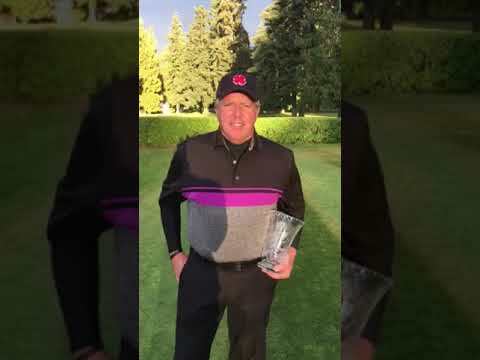 wins the 10th Washington State Super Senior Men's Amateur Championship. Post-round interview with Michael Ciez of Walla Walla, Wash., winner of the 8th Washington State Men's Mid-Amateur Championship. Joe Highsmith wins the 91st Washington State Men's Amateur Championship. Jim Moore and Shon Crewe discuss the week in golf with Michael McEwan of Bunkered Golf Magazine and they explain why diving for golf balls in Gator infested waters is a bad idea in Sweeping the Dial Golf Style. Jim Moore and Shon Crewe discuss NBA star Stephen Curry playing in a Web.com Tour event, a recent ESPN article urging Tiger Woods to retire and take up coaching, and they talk to President & CEO of Great Northwest Wine Eric Degerman about some fun golf and wine trips. Jason and Mark Aspelund win the 9th Annual Washington State Parent-Child Championship, hosted by High Cedars Golf Club. Webinar: How is a Handicap Index Calculated? Collin from the WSGA's handicap department covers how a Handicap Index is calculated. Since a Handicap Index effects the majority of golfers, we encourage everyone to watch and learn how this number comes to be! Julianne Alvarez wins the 2017 Washington State Women's Amateur Championship. Victoria Fallgren wins the 2017 Washington State Women's Mid-Amateur Championship. Yasue Alkins wins the 2017 Washington State Senior Women's Amateur Championship. Jim Moore discusses the upcoming US Open with Senior writer for the Golf Channel Rex Hoggard and he previews the Boeing Classic golf tournament with director Brian Flajole. Jim Moore and Shon Crewe discuss all the golf news of the week, including the upcoming US Open and the latest Tiger Woods drama with SB Nation Golf Writer Trevor Reaske, and they discuss the local US Open Sectional Qualifier, aka Golf's Longest Day, at Tacoma C&GC with Sr. The Rules of Golf state that you are only allowed a maximum of 14 clubs in your golf bag. If you could only five clubs, which five would you choose? A video on the late Ken Still, a true Northwest golf legend. Courtesy of Fircrest Golf Club. Jim Moore and Shon Crewe discuss the Masters and the Lexi Thompson rules violation with contributor to Golf Channel and Golf Digest Ron Sirak and they talk to Head Golf Pro at Salish Cliffs Golf Club David Kass. Want to compete with your buddies from different tees??? Jim Moore and Shon Crewe discuss the Masters Golf Tournament with Todd Millis of the Tacoma News Tribune, and they bring you the biggest golf stories of the week in Sweeping the Dial Golf Style. Be sure to stay tuned at the 39:00 mark, as Jim & Shon talk about the special WSGA prescreening of the film "Tommy's Honour" on Thursday, April 13 in downtown Tacoma! Cam Rogers joins Jim & Shon to talk about the world of golf and what to expect from the Masters. Plus, Sweeping the Dial and golf rules. Jim Moore and Shon Crewe run down all the golf news of the week with Sweeping the Dial Golf Style and they talk to Rex Hoggard of the Golf Channel. Jim Moore and Shon Crewe bring you the Top 5 Golf Stories of the Week, and they talk to Keith Bank, Producer of the upcoming golf film "Tommy's Honour." Andrew Putnam of University Place, Wash. won the Panama Claro Championship on Sunday for his second Web.com Tour title, beating Chris Baker with an 18-foot birdie putt on the first hole of a playoff. A sport environment in which participants - athletes, coaches, volunteers, and officials - are exposed to negative experiences such as bullying can be harmful and cause individuals to quit. Jim Moore and Shon Crewe discuss discuss this weekend's Boeing Classic with Todd Milles of the News Tribune and they talk to Executive Director of the Pacific Northwest Golf Association and the Washington State Golf Association Troy Andrew (discussing Youth On Course). Jim Moore and Shon Crewe discuss Golf in the Olympics with Assistant Editor of Bunkered Golf Magazine Michael McEwan and they talk to PGA Golfer Billy Mayfair on the upcoming Boeing Classic. Jim Moore and Shon Crewe discuss the return of Golf to the Olympics with Senior Writer for the Golf Channel Rex Hogart and they talk to Arizona State University Men's Golf Coach Matt Thurmond on his transition from the University of Washington to ASU. The WSGA discusses Section 4-1 and 4-2 of the USGA Handicap System. Brooke Henderson, winner of the 2016 KPMG Women's PGA Championship, held at Sahalee Country Club, has good feelings about playing in the Pacific Northwest. Brooke Henderson, winner of the 2016 KPMG Women's PGA Championship, says she loved how the roars echoed around Sahalee CC. World #1 Lydia Ko, runner-up at the 2016 KPMG Women's PGA Championship, says there was a huge number of spectators at Sahalee CC. Jim Moore and Shon Crewe are live from the site of the 2016 KPMG Women's PGA Championship and they talk to LPGA legend Annika Sorenstam, Karen Stupple of the Golf Channel, Kerry Haigh of the PGA and Kacie Bray of the Washington State Golf Association. Jim Moore and Shon Crewe are live from the 2016 KPMG Women's PGA Championship at Sahalee. They talk to Championship Director Sean Riley, Steve Eubanks of the Global Golf Post and Todd Milles of the Tacoma News Tribune. The WSGA discusses Section 4-3 of the USGA Handicap System, Equitable Stroke Control. If you could have as many clubs as you want, how many would you have? Kevin and Collin from the WSGA are at The Home Course talking about Section 3-5 of the USGA Handicap System, players competing from different tees or men vs women from the same tees. If you could change any of the Rules of Golf, which would one it be and why? The WSGA gives an introduction to TPP Online. Kevin Jones creates a Best Ball event from start to finish. This is a recording of our webinar from March 24th covering the changes to the USGA Handicap System for 2016-2017. Kevin takes you through activating and inactivating members using the Online GHIN Handicap Program.